It's been a while since I did a Show & Tell. This one is for the many 'bag ladies' among you. When I bought myself a Mia Tui 'Emma' and decided to feature it in the Festive Gift Guide, many readers ordered them too. I had lots of positive feedback and went on to buy several more Mia Tui bags as gifts (and for myself). Emma remains my bag of choice when I need to carry a lot of stuff and it's especially great for travelling. 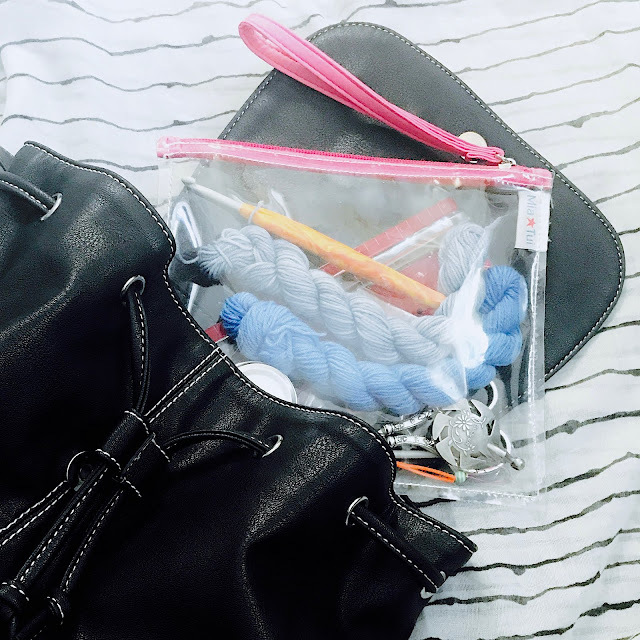 I use it for hand luggage on planes and as an overnight bag for short trips. When I'm walking the dog or popping out to the local shop, I typically use the Lily Clutch that came with Emma (or one of the other colours I subsequently purchased) with the long strap option, and a Sue Shopper tucked away inside it. I was trying to decide on a mid-sized 'everyday' option to carry my knitting in, when I spotted the new Ruby Rucksack which includes all the the features I love in (MT founder) Charlotte's other bags, but in my favourite 'everyday' size and format. Charlotte asked if I'd like to try one out, and of course I agreed. So I didn't pay for the bag I reviewed, but I am a regular Mia Tui customer - I put my money where my mouth is - and I have given as balanced a review as possible. Photos (c) Mia Tui, used with permission. For a fairly compact bag (28 cm at base x 32 cm high), there's a whole lot of space inside thanks to the pockets/dividers. The bright pink lining makes it easy to find things - there is no 'black hole'. There is an insulated bottle holder, a large expandable (poppered) pocket which fits a kindle/book/ipad mini, a phone pocket which fits my iPhone 7 Plus, an elasticated key fob and two pen holders. A clear PVC zip bag is also included (which is perfect for notions or lotions) - pictured below. On the back of the bag is a 'secret' zipped compartment which is not accessible from the main opening. This is the place I actually keep my phone and purse. It means that when my bag is on my back, those things are inaccessible to anyone else. 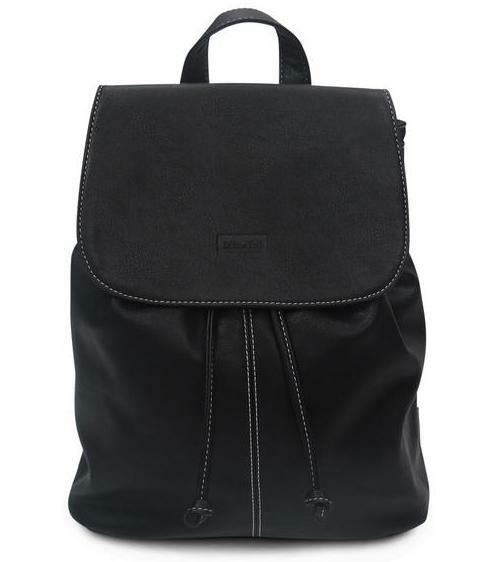 The only thing I would change about this bag is that I'd prefer to have the 'secret' pocket opening on the other side - with the zip to the left. 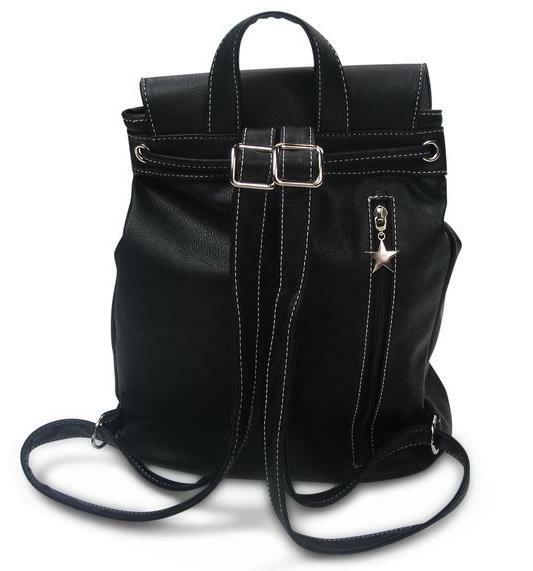 I tend to carry it on my right shoulder, if only using one strap (in a queue, for example) and would be able to access the zip without totally removing the bag if that were the case. But that's the only thing I would change. It's a great design - very practical, without looking utilitarian. Ruby is lightweight, at only 630g, and with adjustable back-straps, is very comfortable to wear. The handle at the top means it's also easy to tote around. It's big enough for the things you need, without being tempted to unnecessarily over-fill it. I've been using Ruby as my main 'handbag' for a few weeks and love it. In this hot weather, the insulated drink pocket has been very useful - as my bottle is upright and contained, there is no chance of it spilling on my handbag knitting! Incidentally, with knitting in the main compartment, and using a centre-pull ball, the yarn will happily trail out of the closed top (if it's not tied too tightly) so you can knit on the go without having your bag open. You can even knit as you walk - but PLEASE BE CAREFUL! Ruby is available now, in four colours, for only £40 + postage. 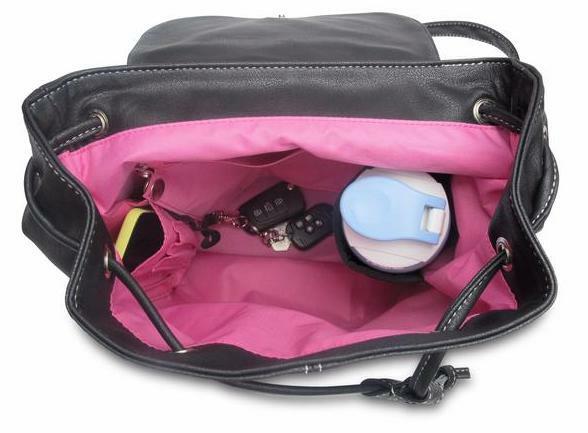 However, using the code CWTCH20 will get you a generous 20% discount on this or ANY full price Mia Tui bag. (I would also highly recommend the shopper and the makeup bag, both of which I use every day - they would make great teacher gifts if you are in a last minute panic about that). Happy shopping! Thanks for a great review and what a generous discount too from Mia Tui.As an avid sock knitter I can see many pairs of socks transported in a Ruby rucksack.